I found over the years that there are many dishes, be they breakfast, dinner or dessert, where pumpkin can be snuck in to give it a little fall kick. 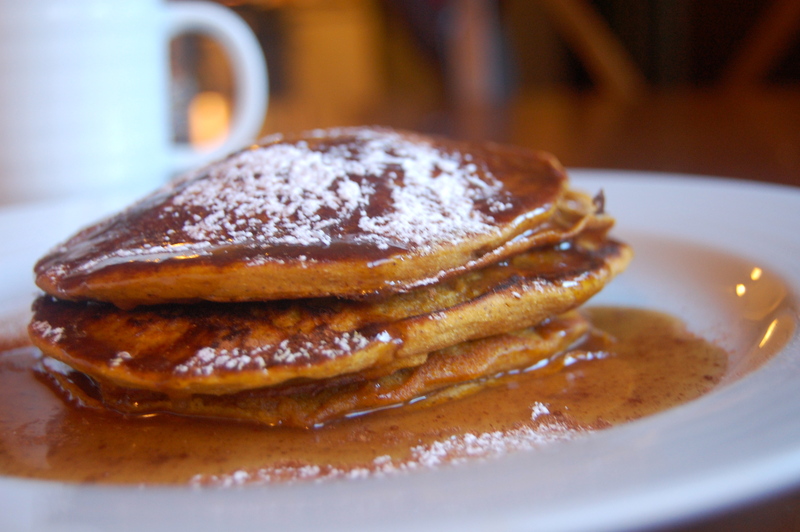 One of my favorites are these easy pumpkin pancakes. With a little extra doctoring on a boxed pancake mix (or make your own pancake mix if you are feeling up to it), you can create a savory and sweet, warm fall breakfast. You can use a boxed mix that just adds water or one where you add milk and eggs. Whatever you have on hand will work just great. Regular syrup tastes just fine on these fall flapjacks, but this extra trick with maple syrup takes them up a notch. 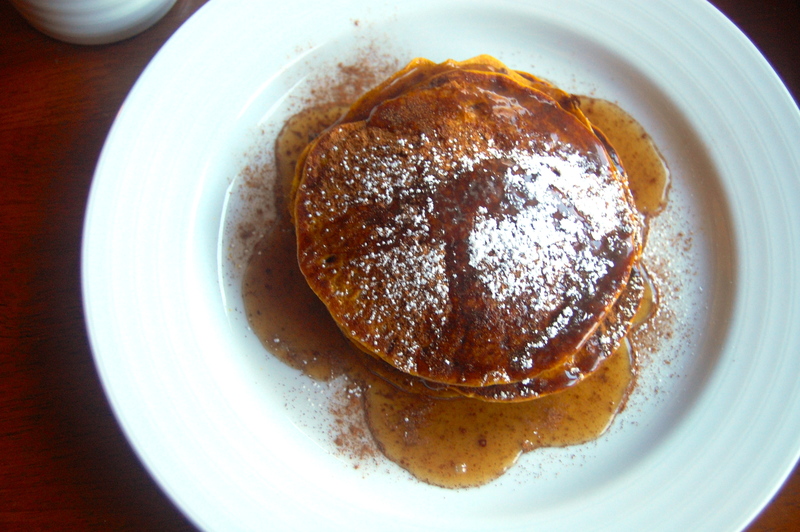 The syrup was inspired by a creamy maple syrup I had at the most delicious Pancake Pantry in Nashville this past spring. I tried it once and had to have it again! Cinnamon and powdered sugar for dusting. Preheat griddle to high heat. In a spouted mixing bowl, mix pancake mix and other mix-ins according to box directions. Add pumpkin and spices, whisk until smooth. Most likely, your batter may look a little too thick. Add 3-4 TBSP of liquid (water or milk, depending on what you started with). Spray griddle with cooking spray. Pour batter onto griddle, varying in size depending on the size you desire. When the pancakes start to crisp at the edge and little bubbles form over the top, flip over. When heated through, remove from heat. In a small saucepan, heat syrup over medium high heat. Once heated through (not boiling), add cream and whisk. Heat, stirring occasionally, until heated through about 4-5 minutes. Add a dash of cinnamon and whisk. Serve warm over pancakes. With a little extra dash of cinnamon, if desired, and a dash of powdered sugar, there is no better way to wake up on a crisp and cool fall morning.